I’d never heard of it. I’d been doing yoga off and on for almost 15 years, and didn’t know that such a thing was possible. Someone can simply propel you into deep and profound meditation? Wow! Really? Then I experienced it. I got Shaktipat and my life changed forever. I am so grateful. “Such Masters are rare,” my Guru often used a classical yogic metaphor to explain. “Instead of teaching you how to grow a mango tree, they slice open a ripe mango for you to eat.” Such Masters must qualify to do this work. They must have been born unenlightened, received Shaktipat from their Guru, served him and studied with him until authorized to do the work. They must be a Kundalini Master, one who has completed the inner journey and can ignite it for others. My Baba qualified on every count. Immediate and profound meditative experiences opened up from the moment I received his initiation. It’s called Maha-Shaktipat Diksha, “maha” meaning the greatest of all the types of “shaktipat,” meaning an energetic infusion that falls in the category of “diksha,” a holy consecration or initiation. Other types of dishka are not energetic infusions. For example, mantra diskha is when you receive a mantra, which might be from an enlightened or an unenlightened being. It gives you Sanskrit words to use on yourself, words that are more beneficial and uplifting than the things you usually say or think. Over time, they wear away your limitations. How wonderful! There are other types of Shaktipat, energetic infusions that are about healing and happiness. While these are beneficial and important goals, they are not yoga. Yoga’s goal is that you become enlightened in this lifetime. Do you want it? I did. At the time, I didn’t have the words to name what I wanted, but it was what I had been seeking in so many ways. The map of my life had been like a dotted line meandering through a desert, looking for an oasis of spirituality. I visited many oases, but without finding the river that fed them all. When I got Shaktipat, I found not only the river, but the source of the river. I’ve been drinking from it ever since. It’s inside. Maha-Shaktipat Diksha opens it up. Now I am graced with the privilege of giving the gift my Guru gave me. 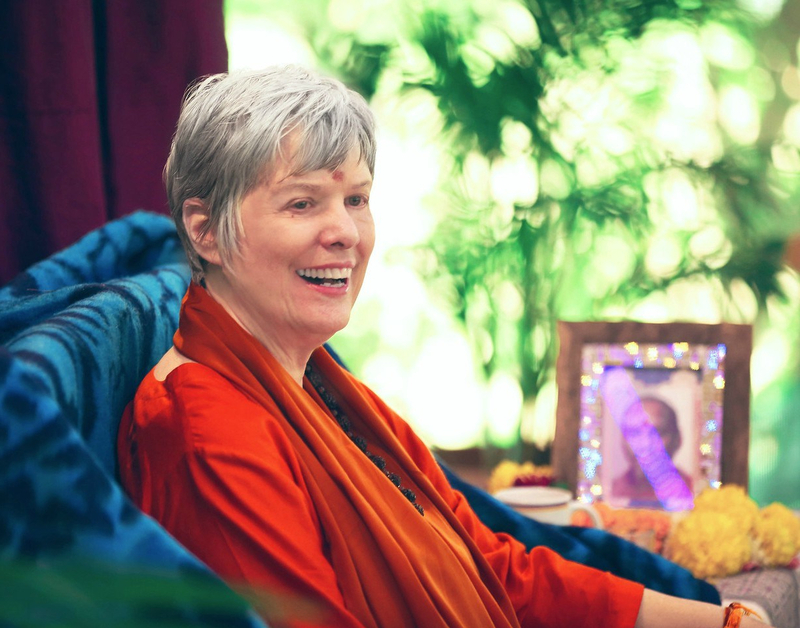 Muktananda gave Shaktipat to tens of thousands of people, maybe hundreds of thousands. We were so fortunate to receive his gift. Yet few have been authorized to carry on his work. It’s a sacred trust. It is my way of serving him, by serving you. Near the end of his life, he had so much to give. Instead of resting on his laurels, of which he had many, he continued to give us Shaktipat. Several times every evening, without warning, he’d burst into the meditation hall adjoining his bedroom and walk among us, touching our foreheads and blasting us open again. In the years I had with him, I received Shaktipat over 200 times. Only once is needed, they say, but I needed more. It was like I’d been dying of thirst, having lived in a spiritual desert for so many years. I soaked up what he gave; it emanated off of him. He had a vibe. Consciousness has a vibe. Your innermost essence is Divine Consciousness, but you don’t know. Not yet. It needs to be uncovered. It needs to be initiated — a new beginning. Maha-Shaktipat-Diksha gives you your own Self. This entry was posted in Ashram News on August 16, 2018 by Svaroopa Vidya Ashram.